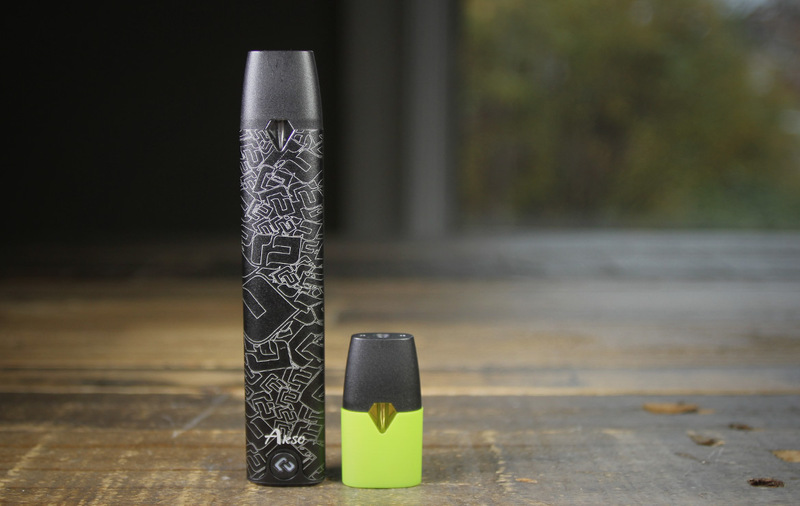 At first glance the Akso with it’s curved or round body and pod make it softer and less edgy to the touch than a lot of competitors in this stick like pod system category. While the graphic pattern on the body of the mod may not be for everyone, it has grown on us, it’s different and is standing the test of time. The click and sold feel of the comfortable pod with a juice level window are some of the nicest and best quality we have encountered to date. The taper of the mouth piece just feels right. The integrated look of the Hcigar logo that also acts as the battery indicator is a nice touch and gives it a high-end flair. The Akso branding is subtle, which we like. It’s those rounded edges and the all metal body that really make this pod system feed so much better quality than all the rest. So many feel disposable from day one. Flavour is very, very good for a pod. It has to be the Ceramic coils. They are clean and hit really consistent. Our kit came with ‘Nutty Tobacco’ and ‘Ice Mint’ and both were quite tasty. The Nutty Tobacco really surprising us. The biggest issue with this whole system is market penetration, it’s hard to source pods locally. We have yet to try any other flavours, sure Heaven Gifts has them all in stock and there are 8 to choose from (Ice Tobacco, Ice Lychee, Nutty Tobacco, Mango Butter, Strawberry, Charcoal Coffee, Ice Mint & Classice Tobacco) but having to wait up to a couple weeks to get your hands on more pods when you run out might be a problem for some. Some of the flavours sound great to us, we would love to try the Mango, Lychee, and even maybe the weirder Charcoal Coffee. But One this has to be said, the flavour never gives up for the life of the coils we vaped. Airflow is a nice tight MTL, maybe a little tighter than a Juul but with a much more satisfying vapor density. The vapor production is far better than many pods on the market. There is no AFC but we don’t think it’s really applicable in this segment anyway. Pods come in really high quality colour coded sleeves that correspond to the flavour profile making it easy to identify them. The build quality of them is outstanding. The plastic used for the mouth has the perfect mouth feel (doesn’t feel cheap). The most impressive part is the click when a pod is inserted in the mod and there is zero and we truly me zero play of any kind. The 1.8ml of juice last an impressively long time. We are heavy vapes and a fresh pod lasts 2-3 days of hard vaping, meaning it might last a casual vaper up to a week. Having almost a 1ml more than a lot of the competition is a big plus. We have already eluded to the fit & finish of the Akso. When you pick up along side a lot of other pod systems it feels like it’s in a class of its own. This might just be one of the best systems on the market and right now it feels under appreciated, at least in the North American markets. More shops need to stock the Akso, we think it would take off like mad. In the meantime we have ordered what we think might be re-fillable empty pods (we have included a link below) from Heaven Gifts and are stoked to give them a go when they arrive. Using this with our favourite juices would be next level. Here is to hoping they arrive soon, we just finished the last of out two included pods as we finish this review. Nice work Hcigar, the Akso is one awesome system.